When I was on Erin Cooks a few weeks ago she was running a contest from The Lazy Baker. To enter I had to leave a comment about which one I would like to try- Brown Sugar Pecan Shortbread. Well I get an email from Erin…. I won!! So exciting. Even better was that the folks at Lazy Baker were really quick about sending out the mix and I got it 2 days later. Well on Monday night I thought it was a perfect day to try them. Being labor day and the fact that is a mix I thought the minimal effort would be good, and reflect well on the holiday. The mix was really easy to follow, only 7 simple steps (and the last is ‘let cookies cool and enjoy’), and you only need to add 1 1/2 sticks of butter and some vanilla. I used unsalted butter and my homemade vanilla extract. 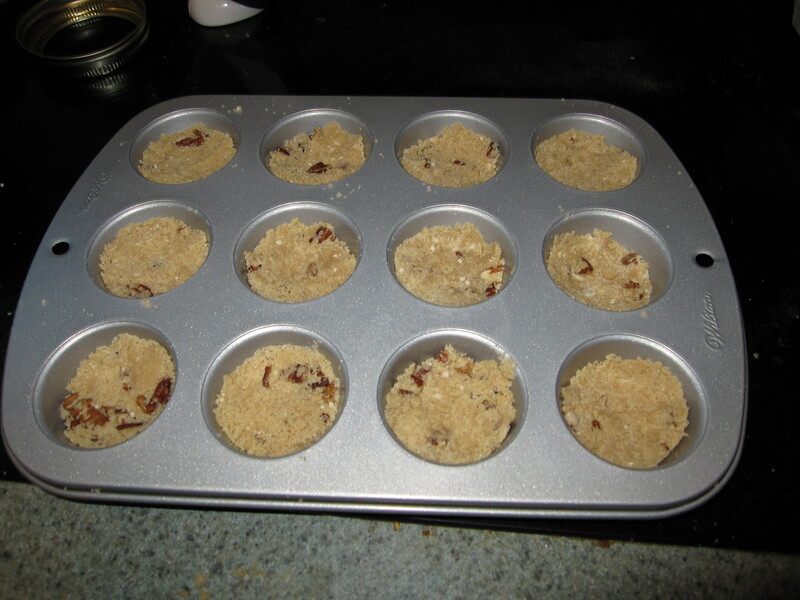 Cookies in the mini muffin pan, pre visit to the oven. I thought The Lazy Baker Brown Sugar Pecan Cookies were really good. So good in fact that we ate them right out of the oven with some milk (yea, I burned my mouth on one- I’m not very patient), which is why I forgot to take a picture of them all done. There was a nice cinnamon flavor that was followed by a punch of brown sugar. I could clearly taste the brown sugar- it reminded me of a mellow carmel. There was a very good ratio of pecan to cookie. The texture was very good- crumby and soft, with the contrasting pieces of pecan. I did notice that the ones that managed to live another day were a bit chewy but I liked them just was much as right from the oven. The Lazy Baker currently has 4 mixes and I think I will try another, like the double chocolate chip. I really want to try their seasonal cranberry pistasio shortbread- which is coming soon. I think those will be trouble… I wold pop them in my mouth way too quick.